We at the PFF Forecast are excited to introduce you to PFF’s newest product, PFF Greenline. Last season, the two of us (@PFF_George, @PFF_EricEager) had a weekly column with five picks, either against the spread or on over/unders using mathematical models based off of PFF grades and other data. These picks finished the season 49-37-5 (57.0 percent). 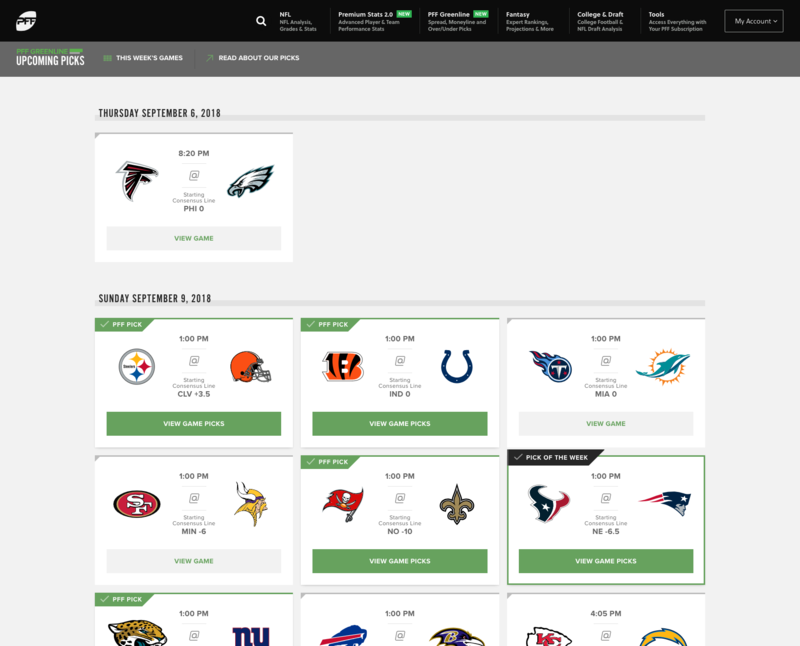 Among those picks, we chose one each week to present on the PFF NFL Show (affectionately called the “Lock of the Week”), and gave out Thursday Night Football picks as well. These picks went 14-6-1 (70.0 percent) and 11-2 (84.6 percent), respectively. PFF Greenline is an online hub that will surfaces all the information you need to know for your weekly investment strategy. 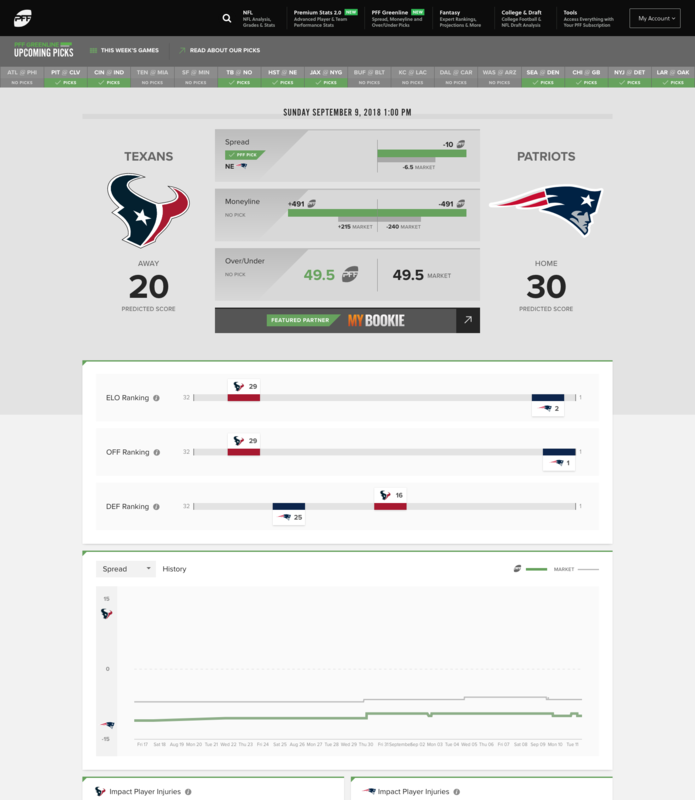 PFF Greenline provides a real time look at all NFL games with PFF predictions for the spread, moneyline and over/under. The goal of PFF Greenline is to give PFF Elite subscribers not only the investment advice but also some of the “why” behind each overall number. These include our PFF ELO rankings, offensive and defensive rankings, key injury information, key PFF metrics for each quarterback and more. Another advantage to having PFF Greenline at your fingertips will be the ability to take advantage of early-week market inefficiency. The PFF Forecast podcast will provide a Monday morning edition that looks ahead to the next week’s slate, and the Greenline dashboard will update each week on Tuesday. During the season, our record will be posted at the top of the PFF Greenline dashboard. These records are taken from when PFF Greenline goes live each week. Lines and prices become more efficient as the week progresses, and hence it is often the case that fewer and different games are picks later in the week than at the beginning of the week. This season is not just about making smart allocations of dinero, it is also about trying to do some good for those less fortunate. We, the PFF Forecast duo, are going to do this in two ways and we hope you’ll join us in as many as fit your budget. First, we will be entering the season-long Westgate SuperContest (pick five games per week against the spread) thanks to the great proxy service provided by FootballContest.com and we will be donating half of any winnings to a couple of very well-deserving charities. Secondly, we will make a weekly C-note investment on the Lock of the Week for which proceeds will be shipped out to those that truly need it. Both of us (George and Eric) have selected charities that contribute to issues near and dear to our heart. I, George, have selected the Ronald McDonald House after seeing my sister battle bone cancer for the past two years. There are so many families who don’t have the ability to battle cancer as they should and hopefully we can help change that. Eric has informed me that he desperately wants to help those who need it most and will do the most with what they have, which is why he will be donating all of his share to “the Ghandi of our generation, Elon Musk”… we pray for Eric. And by Elon Musk, I, Eric, am here to tell you that George means The International Justice Mission. We encourage you, the readers, listeners and consumers to join us in this endeavor, and we will share iTunes reviews and Twitter comments pertaining therein on the Forecast weekly.